Strong south easterly winds of up to 22 knots, heavy showers, thunder and lightning shaped Day 10 of the Perth 2011 ISAF Sailing World Championships as the 49er, Women’s 470, Men’s RS:X and Laser classes started their title campaigns in the second week of competition. 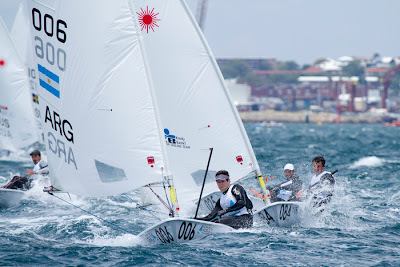 The Kiwi pair of Peter Burling and Blair Tuke (NZL) share the overall lead with Denmark’s Jonas Warrer and Soeren Hansen after the first day of 49er racing.Warrer and Hansen easily won race one on in the Yellow fleet with an 85 second advantage over fellow countrymen Peter Andersen and Nicolai Thorsell, who placed second. While John Pink and Rick Peacock (GBR) dominated race two they only finished six seconds ahead of Emil Toft Nielsen and Simon Toft Nielsen (DEN).Tobias Schadewaldt and Hannes Baumann (GER) took out the third race, only just beating New Zealand’s Burling and Tuke, while Pink and Peacock (GBR) finished a disappointing 16th after their win in the previous race. In the Blue fleet, David Evans and Edward Powys (GBR) lead for most of race one, finishing first by 13 seconds ahead of Matt McGovern and Ryan Seaton (IRL). 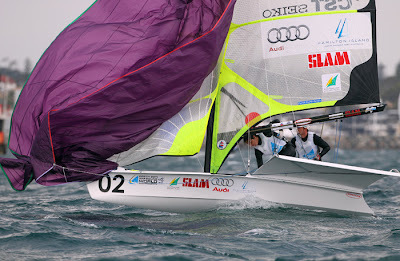 Stephane Christidis and Emmanuel Dyen (FRA) won race 2, while Erik Heil and Thomas Ploessel (GER) were second. World number one pair Nathan Outteridge and Iain Jensen (AUS) finally showed some of their best to win the last Blue fleet race of the day. Noe Delpech and Julien Dortoli (FRA) were second. The Australians are tenth overall. 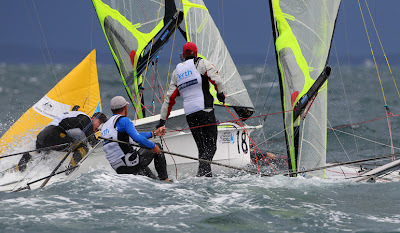 The 49ers are scheduled to continue racing on Tuesday at 1200 Perth time on the Owen course. ‘Big’ sums up the opening day of Women’s 470 with big movers, big surprises and big leads. Japan’s Ai Kondo and Wakako Tabata finished the day in first place overall followed closely by Lisa Westerhof and Lobke Berkhout (NED) with Penny Clark and Katrina Hughes (GBR) rounding out the top three. The Japanese sailors were the big movers, giving stellar performances in both races. Race one saw them come from 14th around the first mark to finish third, only 14 seconds behind Natalia Ivanova and Diana Krutskikh (RUS), who were second. World number two Penny Clark and Katrina Hughes maintained a 200m lead throughout race one to finish comfortably two minutes ahead of Ivanova and Krutskikh (RUS). Kondo and Tabata improved in race two, taking the lead at the start and holding it to the end. If Kondo and Tabata were the big movers, the big surprise was World number one pair, Erin Maxwell and Isabelle Kinsolving (USA), finishing 27th at the end of the first day of Women’s 470 fleet racing. 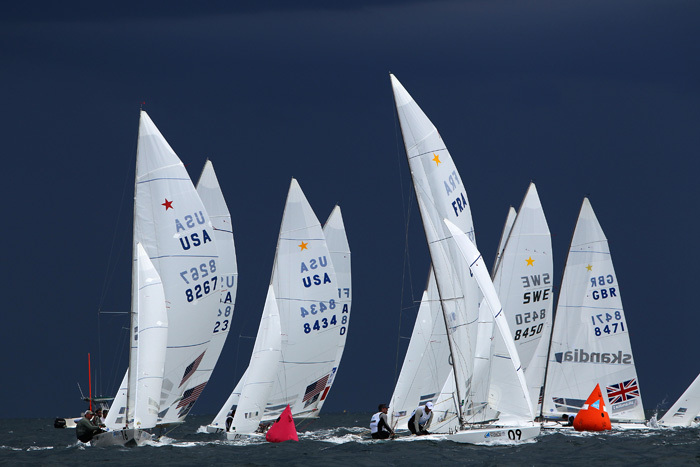 Women’s 470 racing for races three and four continues Tuesday at 1430 local time on the Success course. Israel’s Nimrod Mashich and Piotr Myszka of Poland share top spot on the leader board after the opening day of racing in the men’s RS:X. Both men are on three points with a win and a second after two races with Dorian Rijsselberghe (NED) and Przemyslaw Miarczynski (POL) behind them on overall points. 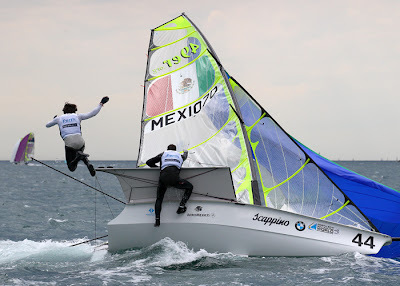 In race 1, World number one Myszka was neck and neck with rival Polish competitor Przemyslaw Miarczynski in the second upwind leg, but Miarczynski eventually had to settle for fourth. World number 12 Tom Ashley (NZL) finished second after a tacking duel with Eliot Carney (GBR). 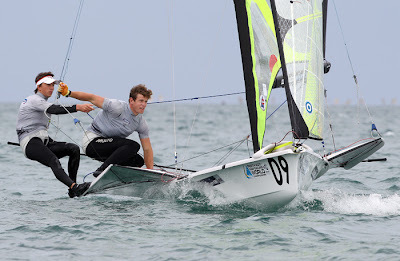 Carney placed 3rd, ahead of his teammate Nick Dempsey, who despite sailing strongly mid-race, finished 8th. The second yellow race was a success all round for the two top Polish sailors as Miarczynski shot to first place with Myszka in his wake. Windsurfing veteran Joao Rodrigues, who came third, is hoping he can make London 2012 his sixth Olympic Games. Dorian Rijsselberghe (NED) cemented his status as “one to watch” for these World Championships. In the final leg of the first race Rijsselberghe took advantage of the light winds to move swiftly past world Number two Nimrod Mashich (ISR) to win. But Rjisselberghe lost out to Mashich and Tae Hoon Lee (KOR) in the blue fleet’s second race. The men’s RS:X is scheduled to continue on Centre course from 1230 Perth time on Tuesday. 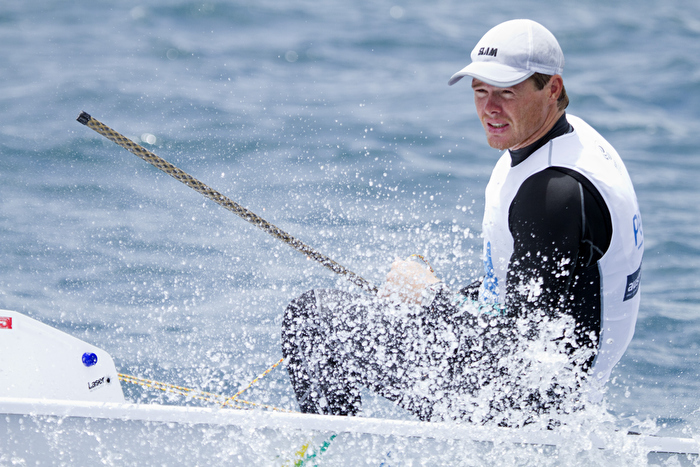 The three-time Laser champion and 2010 ISAF Rolex Sailor of the Year, Tom Slingsby (AUS), swamped the field in the opening race of the day but made an uncharacteristic error in the second to finish sixth with the mistake costing him top spot on the leader board. Slingsby has seven points after the first day of Laser racing, one behind Blue fleet’s Jesper Stalheim (SWE). “I guess it was my fault, I should have looked where the top mark was,” Slingsby said. “I tacked off the line, went for a few minutes, then tacked back and was over-laid by a long way, hundreds of metres. I rounded in the high teens or low twenties and was able to pull to six. Slingsby was 35 seconds clear of Kacper Zieminski (POL) in race one with Sweden’s Rasmus Myrgren a further 30 seconds back. Australia’s Ashley Brunning finished the day with two fourths to put him equal third overall. Poland’s Karol Porozynsky scored a fifth and a second to lead the Red fleet with seven points from Germany’s Simon Grodeluschen on eight points with a seventh and a win. 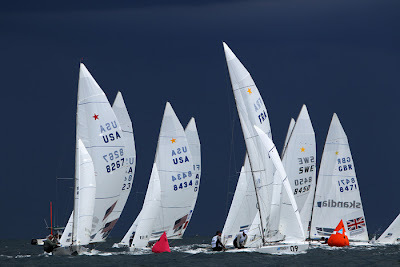 The Yellow and Blue fleets raced in 13-16 knot winds while the Red fleet had consecutive races in the late afternoon with 17-22 knot winds under a leaden sky and frequent lightning flashes. Laser racing is scheduled to continue on the Parmelia course from 1200 local on Tuesday. 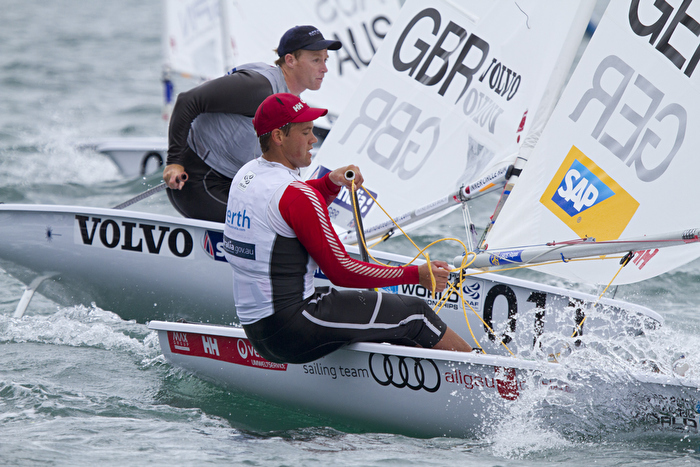 Another outstanding performance from the British Olympic Champions Iain Percy and Andrew Simpson consolidated their first place position in the overall standings after race four in the Star fleet. Percy and Simpson have a total of 16 points while Mark Mendelblatt and Brian Fatih (USA) are on 28 points, with Germany’s Robert Stanjek and Frithjof Kleen just behind them on 30. “We had a good day today. We weren’t going very well but we hung in and fought hard,” Percy said. “My body is a bit bruised and battered for it but it’s okay”. In race three, Norwegian team Eivind Melleby and Petter Morland Pedersen took first followed closely by Aimilios Papathanasiou and Antonios Tsotras of Greece. The fight for third was close with Aimilios Papathanasiou and Antonios Tsotras of Greece just making it, putting Germany’s Johannes Babendererde and Timo Jacobs in fourth place. 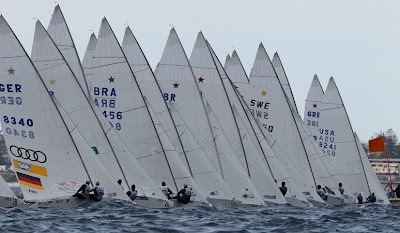 The outcome of race four saw the Swedish pair Fredrik Loof and Max Salminen take first place followed by Brazil’s Robert Scheidt and Bruno Prada. Third went to Ireland’s Peter O’Leary and David Burrows while British pair Percy and Simpson were fourth. 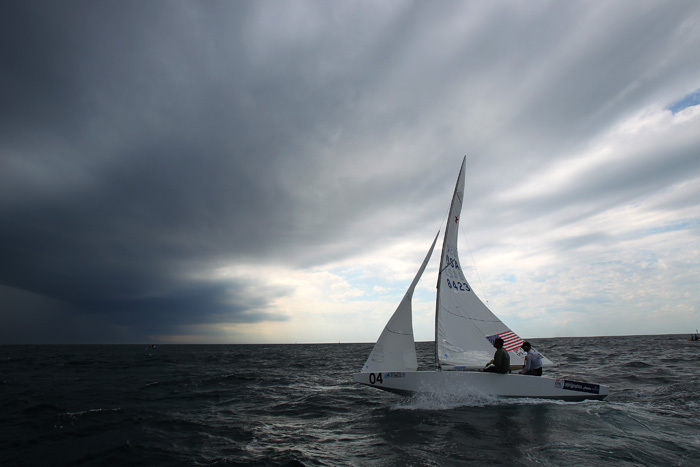 With six more races until the medal race the British are aware of the obstacles to come. “There is still a long way to go, we’re not super quick, so not confident we will get too far but we will keep battling to the end,” he said. Star racing is scheduled to continue on Tuesday on the Leighton course from 1300 Perth time. 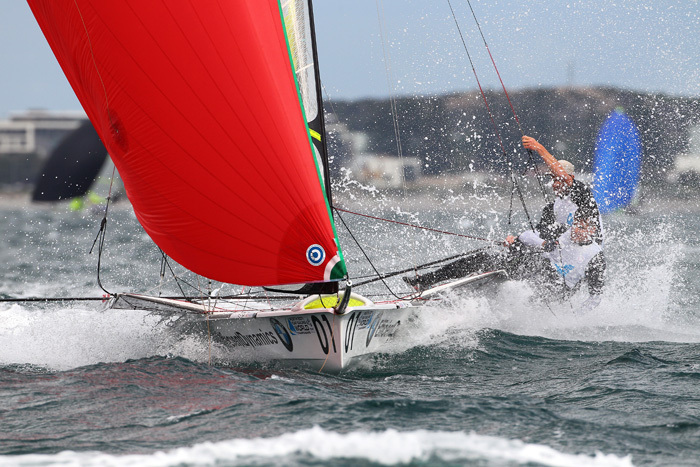 Racing remained close between teams competing in the stage two Round Robin with the competitors aiming to increase their standings before the end of the repechage round on Tuesday. It was a good day for New Zealand’s Stephanie Hazard, with wins against Great Britain’s Lucy Macgregor and Finland’s Silija Lehtinen. With the wind again proving to be fickle, the course was changed to a four lap configuration, meaning the races had to be broken up a bit with a gap between the first two and last two matches. 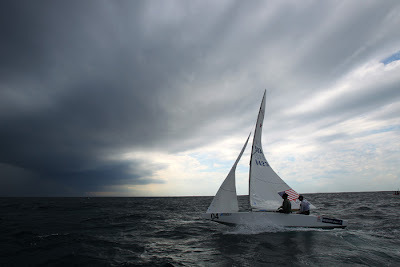 Increasingly bad weather in the late afternoon forced the race committee to postpone the last two matches of Flight 74 until Tuesday. At the end of Monday’s racing, the top teams in stage two were Macgregor (GBR) on 9 wins and 2 losses, with the two Australian teams close behind, both on 8 wins and 3 losses. France’s Claire Leroy will go into quarterfinals in top spot after winning her two matches against USA-1 in the seeding matches held earlier in the day. Anna Tunnicliffe (USA-1) will be second in the Gold Group, followed by Ekaterina Skudina (RUS) in third and Mandy Mulder (NED-1) in fourth position. Stage two Round Robin repechage continues on Tuesday with the remaining flights scheduled from 1200 local.